I find myself really interested in different global mourning customs lately, particularly dress. 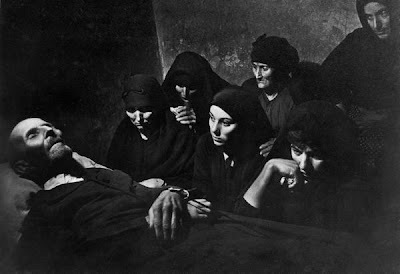 This picture is of women mourning the death of Juan Larra in 1951. The photo is by W. Eugene Smith for Life magazine I think. It's just an awesome picture. I don't know anything about the source of the picture I posted previously, but I came across it a while ago and it has been one of my favorites ever since. E-mail me if you know anything about it!